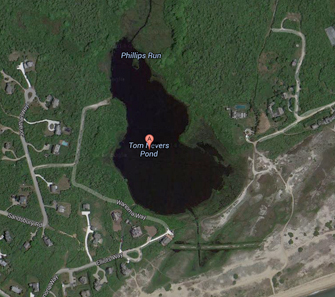 Tom Nevers Pond is the final collector of wetlands and ponds feeding into Phillip’s Run, (see Gibbs Pond), from Gibbs Pond down into the Milestone Road cranberry bog running into the stream of Phillip’s Run gathering water from the swampy land south of Milestone Road. Shallower than most of the island’s great ponds at around four feet, Tom Nevers Pond, like other island ponds swells and shrinks depending on precipitation. Excess water flows through a narrow drainage channel at the pond’s south end and out into the low areas between the Low Beach dune field and the houses along the western end of the ocean side of Low Beach Road.